On February 20, 2011, thousands of Moroccans took to the streets in Rabat, Casablanca, and Tangier, demanding wholesale change to the country’s constitution. The protests were led by the Moroccan Association for Human Rights (AMDH), a Rabat-based organization founded in 1979 by secular, left wing activists and former political prisoners. AMDH leaders had begun strategizing for political change as soon as the Arab Spring began in Tunisia, two months earlier. They created a Facebook page, a new website, and a YouTube video calling on Moroccans to turn out en masse on February 20. In response, more protestors hit the streets than the country had witnessed since major social uprisings in the 1980s. The AMDH’s initial success is puzzling. According to the Human Rights Perceptions Polls, based on a representative sample of 1,100 adults living in Rabat, Casablanca, and their rural environs, Moroccan rights groups have a weak social base. 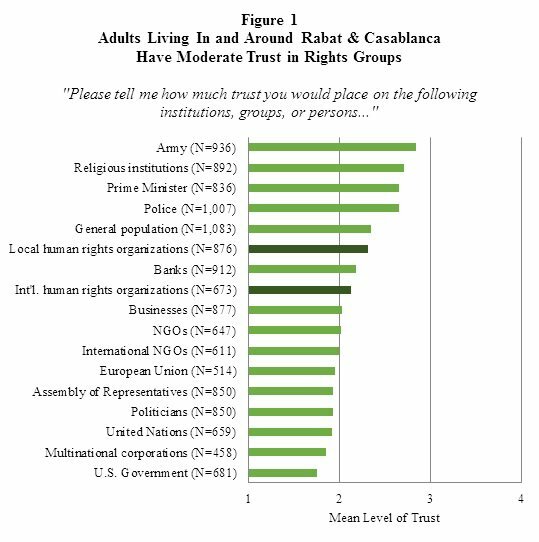 Although the public does afford local human rights organizations (LHROs) some trust, they have little personal contact with these organizations. Consider Figure 1, which charts the public’s trust in LHROs, relative to their trust in other institutions. On a 4-point scale, in which 1 equals “no trust”, adults living in and around Casablanca and Rabat rated LHROs at 2.32, on average. This is lower than the most trusted actors—the army and religious institutions—but much higher than trust in the least trusted institution, the US government. 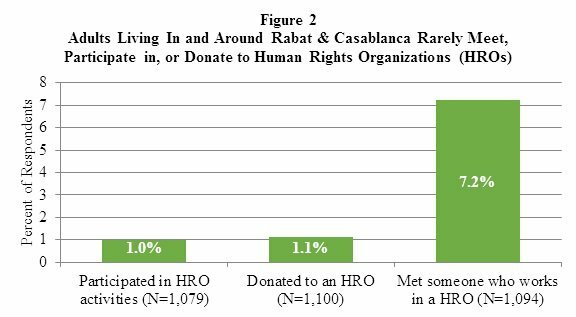 As Figure 2 demonstrates, however, the Moroccan human rights organizations’ contact with the broader population is very infrequent, suggesting that LHROs would struggle to mobilize large numbers. Only 7% of our sample reported ever having met a “human rights worker” (non-governmental or governmental), and only 1% reported ever having participated in the activities of, or donated money to, a human rights organization. Despite this weak social base, however, the AMDH was able to play a pivotal role in the February 20th mass mobilization. It did this by making a crucial alliance with the Justice and Charity Organization (JCO), an Islamist social movement in Morocco that traces its roots to the 1970s. According to a recent study, the JCO has up to 500,000 followers; according to its leaders, the real numbers are even higher. Most observers agree that the JCO has built a broad social base in Morocco through close, frequent contact with the public, strong ideological principles, and attention to organizational detail. Unlike the AMDH and other secular Moroccan human rights groups, which focused on elite-level, anti-regime activities during the “Years of Lead”, Morocco’s repressive 1970s and 80s, the JCO spent its time building ties to ordinary Moroccans. It trained leaders, cultivated sympathizers and devoted time and effort to its popular base. The Human Rights Perception Polls provide a measure of the ideational context in which the JCO thrives. 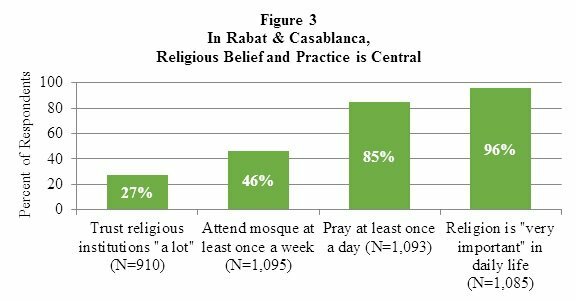 As Figure 3 demonstrates, 96% of Moroccan survey respondents reported that religion was “very important” in their daily lives; 85% prayed at least once a day, and 46% attended mosque at least once a week. In addition, 27% said they trusted Moroccan religious institutions “a lot”, according it 4 on the 1-4 trust scale. Religion, in other words, is crucial to Moroccans, and the JCO has positioned itself squarely within that worldview. Given the JCO’s popular strength, it was crucial that, in February 2011, the AMDH reached out to the Islamists and, in the heat of the moment, built a temporary coalition of convenience. That winter, the joint AMDH-Islamist demonstrations created a powerful street presence, undermining the king’s confidence in his power. Morocco’s monarch quickly adapted, announcing far-reaching concessions that few had expected. Mohammed VI paved the way for a constitutional monarchy by reducing his powers, changing Article 19 of the old constitution (which defined the king as a sacred personality), and stressing the primacy of universal human rights over domestic law. The AMDH rejected the king’s concessions, saying they didn’t go far enough. Instead, they and other secular rights activists called for wholesale reconstruction of the state’s governing institutions, including forming a popular assembly to replace the parliament and drafting a new constitution. Although the AMDH did not openly call for the king’s removal, the suggestion was that, under the new system, the king would become little more than a figurehead. 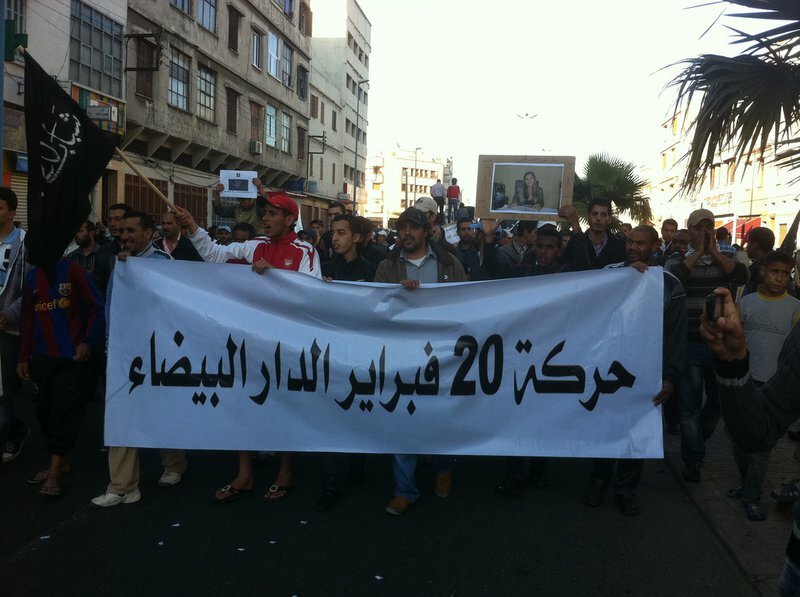 A 20th of February Movement march in Casablanca, Morocco. In a sudden turnabout, the religiously-oriented JCO bolted from its alliance with the secular AMDH and decided to demobilize. Instead, the JCO joined forces with the Islamist Justice and Development Party (PJD), a political party that had accepted the king’s reforms. The reasons behind this sudden about-face remain unclear, but some speculate the JCO struck a deal with both the PJD and the king, abandoning street protests in return for free and fair elections. The JCO is a social movement, not a political party, but their alliance with the parliamentary PJD is mutually beneficial. In November 2011, when the PJD emerged as the leader in national elections with 27% of parliamentary seats, the JCO was the PJD’s silent, but willing, partner. The PJD’s political gains are real. Under the new Moroccan constitution, rewritten by the king in the summer of 2011, the monarch was obliged to select a member of the PJD, as the largest political party, to form the next government. In early 2012, the PJD gained control over major government ministries, including social affairs, economics and foreign affairs. The PJD is thus gaining valuable government experience while proving itself to Moroccan voters. It has also demonstrated its ability to work with the monarchy and earn the king’s trust. For the JCO, the alliance with a successful Islamist political party has provided all manner of benefits, including a mechanism for transitioning into a more overtly political role should it decide to do so in the future. The AMDH and other secular rights activists, by contrast, have emerged weakened from the process. The AMDH and other secular rights activists, by contrast, have emerged weakened from the process. Although they continue to organize weekly protests, their numbers are small and declining. The AMDH has not been successful in advancing its agenda of wholesale government reform, further reductions in monarchical power, poverty reduction, unemployment alleviation, and more. Most importantly, from the AMDH’s perspective, they have not been able to gain a royal pardon for their former leftist comrades in arms. There seem to be several lessons for the Moroccan human rights movement. First, some kind of accommodation with the palace appears crucial for political impact. The Islamists chose to strike a deal, and have been rewarded with power and access. By remaining steadfast opponents to the king, the AMDH has been shut out. More importantly, the AMDH’s inability to sustain a broad-based social movement without the Islamists demonstrates the weakness of their long-term strategy. Although the Human Rights Perceptions Polls do show popular trust in LHROs, good feelings alone cannot sustain a movement. Instead, Morocco’s rights groups must cultivate a robust social base by providing social services and popular education, and by raising money from ordinary members of the public. Failing these efforts, the Moroccan human rights movement is likely to tread water. The Islamists are growing more powerful, while the Ministry of Interior has just banned several AMDH conferences, threatened to strip the group of its legal status, and demonized the NGO as anti-Islamic and anti-national. The time has come for a strategic rethink. The Moroccan human rights movement registered some real successes in the 1990s and 2000s. It put human rights on the monarchy’s agenda, forced the state to recognize past abuses, and advocated successfully on a range of issues. The movement’s reputation among ordinary Moroccans, moreover, is reasonably strong. Without actively cultivating a broad popular base however, Morocco’s local rights groups are destined to remain marginal political players.